I am familiar with the Mr. Kon brand that produces microwavable Chinese pastries such as turnip cakes and scallion pancakes. 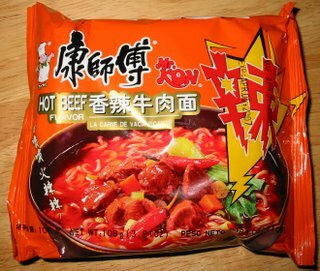 I assume that this brand of instant noodles is associated with the same Mr. Kon, although you can never be sure with the flaky trademarks of Chinese and Taiwanese imports. I do know that Mr. Kon noodles are one of the most popular brands in China. Also, those microwavable pastries were always pretty good so I figured this pack of noodles would be worth a shot. 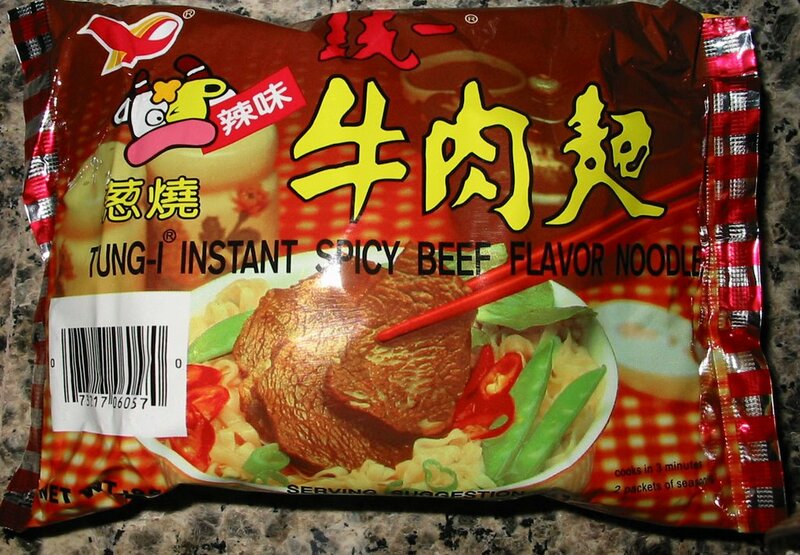 The first thing that stands out on the packaging is the fiery red broth. That stuff looks like it might have come out of a volcano or something, but it is certainly inviting to someone who likes spicy things. 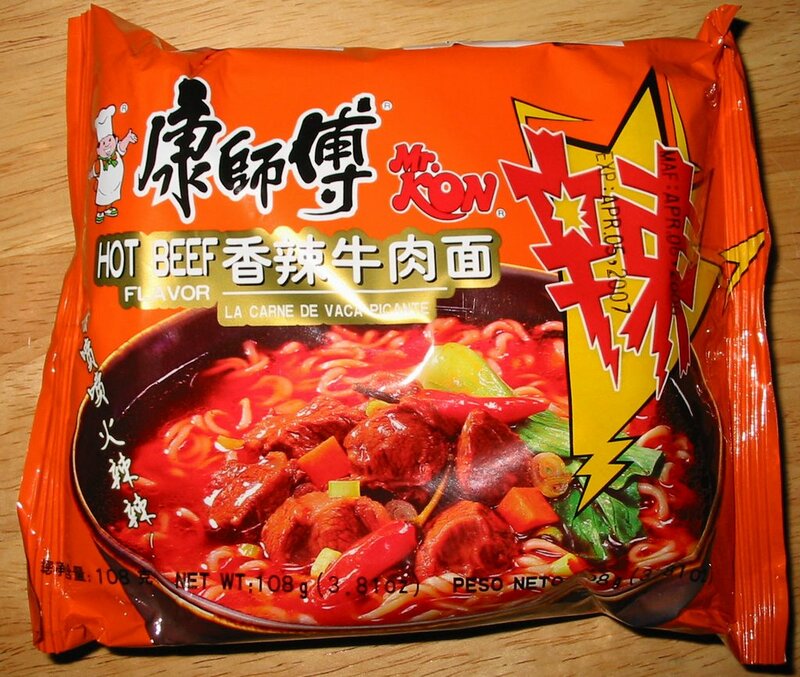 The flavor of the noodles is helpfully written in Spanish, in case you can't read English nor Chinese. Interestingly, these noodles contain 196% of your recommended daily value of sodium. I was a little disappointed that my bowl of noodles didn't have the same molten look as shown in the packaging. But they definitely pack a spicy punch. There are even little slices of red chili peppers to kick it up a notch. 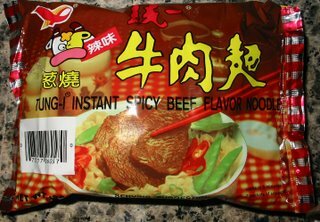 One thing I liked about these noodles was that you could still taste the beef flavor rather then having the whole thing be overwhelmed by spiciness. There was nothing particularly special about these noodles but you can't really go wrong when the spiciness is overpowering all other flavors. It was a little bit too salty for my taste, so maybe they could scale back a little bit on the 196% RDV of sodium! Nothing beats a chilly Boston evening than eating a hot bowl of noodles. 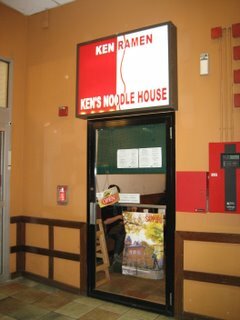 On a recent Saturday night, we had no trouble getting a table at Ken's Ramen. The menu is pretty much unchanged from when I visited earlier this year. There are four or five standard ramens with a clear (salty), soy sauce, or miso broth for around $7. Extra toppings and noodles are available for a few dollars more. On this trip, we ordered the two specialty ramens. 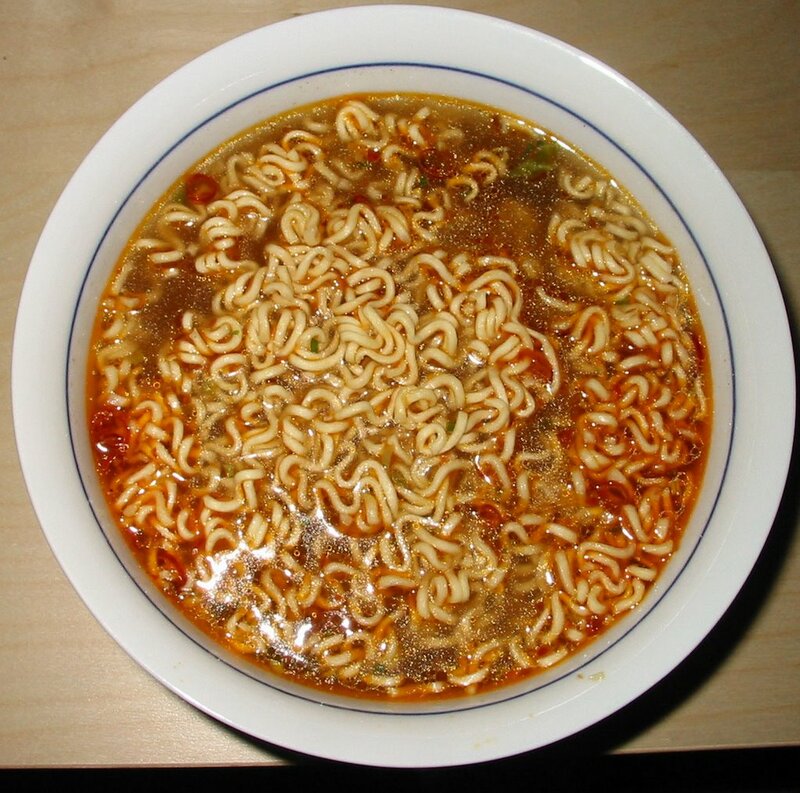 The noodles in the specialty ramens are supposedly imported from Japan, hence the higher cost. The Sapporo specialty ramen is a miso-based broth with egg, roast pork, scallions, corn, bean sprouts, and seaweed. The other specialty ramen is a clear (salty) broth with similar toppings. 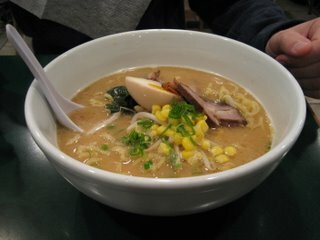 Although the specialty ramens are more expensive than the standard ramens, there are many more toppings to partially justify the additional cost. The ramens are beautifully presented, which heightens the overall experience. 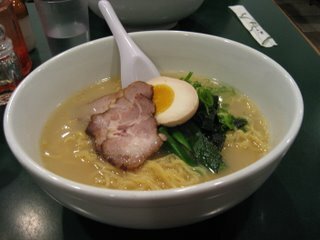 The variety of toppings, the intense and fragrant broth, and the texture of the noodles were all very satisfying. We did not taste anything particularly special about the imported noodles, but perhaps we needed a standard ramen for comparison. I would have liked for the meal, particularly the toppings, to be served at a slightly higher temperature. How does Ken's Ramen compare to Sapporo Ramen in Porter Square? The standard portion size at Ken's, while still a satisfying meal for one person, is significantly less than the gut-busting bowls one gets at Sapporo. However, the quality of the broth and toppings at Ken's far outmatches the run-of-the-mill fare at Sapporo. The artful presentation of the meal at Ken's helps complete a balanced and harmonious ramen experience. 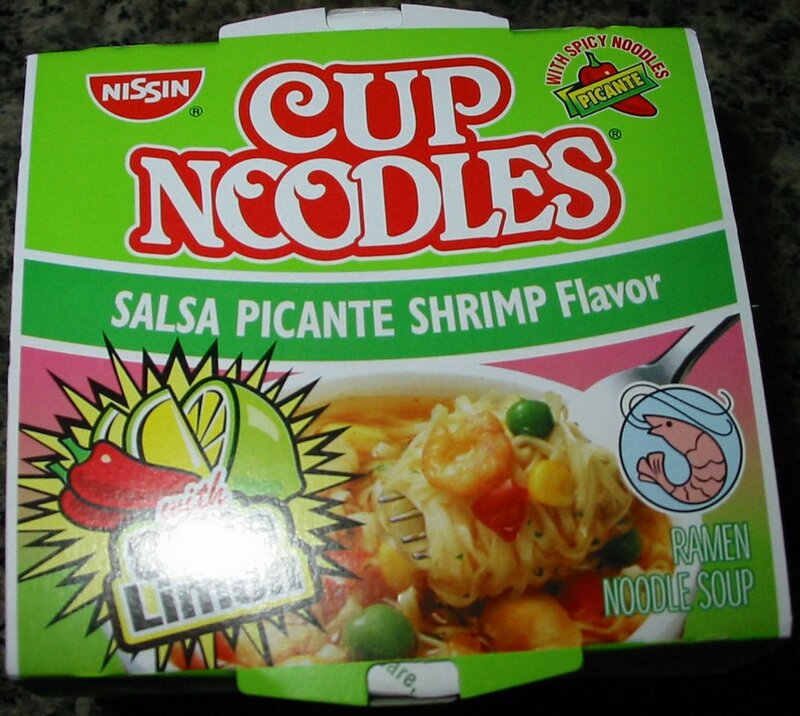 After sampling Maruchan's Lime Chili Flavor With Shrimp, I decided to experiment with Cup Noodles analogous flavor. The packaging is remarkably similar to the Maruchan brand and I would have a tough time telling them apart if I wasn't impeccably trained to recognize the packaging of instant noodles. 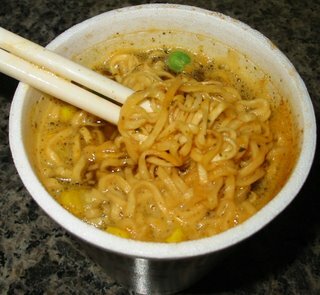 Although Nissin is a Japanese company, the Cup Noodles line found in the US are designed and manufactured within the US. The true imports from Japan are found under the brand name Nissin Demae. 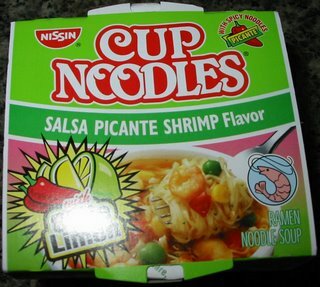 The Nissin Cup Noodles are similar in a lot of ways to the Maruchan Instant Lunch line. They come in a styrofoam cup and are filled with cheap inferior quality noodles. But they are really easy to make as all you need to do is add boiling water and wait a few minutes. So, for the uber-lazy, they are really quite convenient. 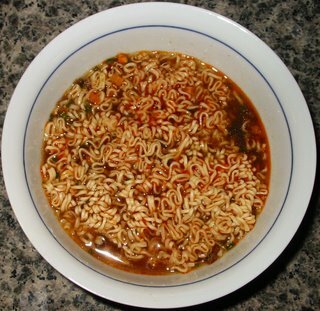 In a lot of ways, these noodles were similar to Maruchan's. The noodles themselves have little taste and are annoyingly thin. Overall, the flavor was not nearly as good as Maruchan's. The lime flavor was there, but tasted more like vinegar than citrus. 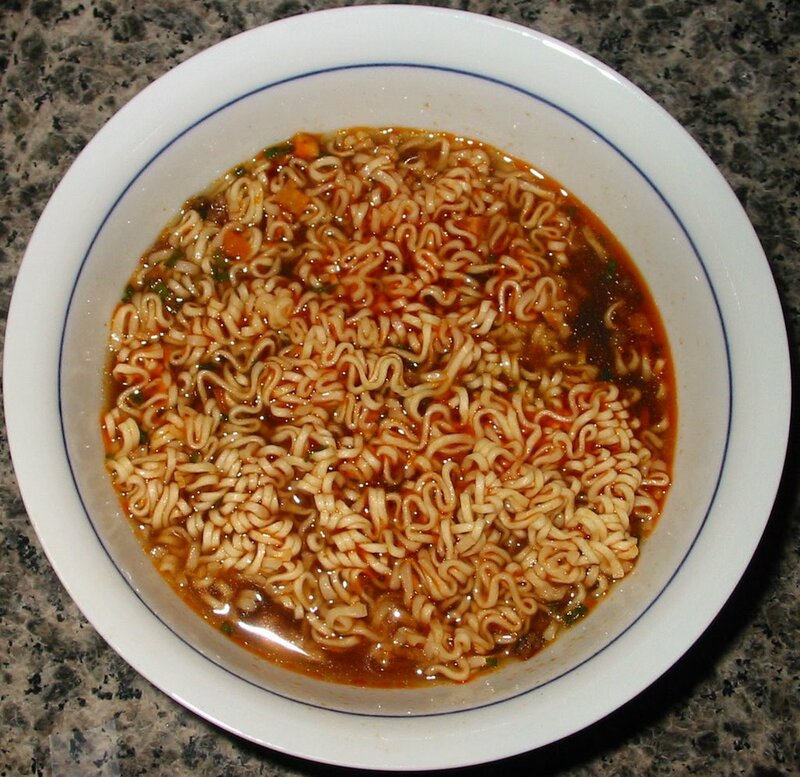 So although they look like twins, the Maruchan version is far superior. With all that said, if you have an opportunity to avoid American made ramen, by all means take it!